REVIEW - Final Fantasy: Record Keeper - Use a Potion! It may seem odd that I’ve finally decided review a game that came out almost nine months ago, but it’s actually taken me that long to put my faith into a free to play Final Fantasy title again. Whilst I’ll openly admit that I’ve never been crazy about free to play titles, I’ve always been willing to give them a try – especially when attached to franchise I love like Final Fantasy. I made a grave error though; I played Final Fantasy: All The Bravest. If ever a title was going to put you off free to play games for life, that was it. Those ‘All The Bravest’ scars have healed now though and I’ve looked past it – I finally gave Final Fantasy: Record Keeper, the latest free to play entry in the Final Fantasy series, a try and I’m completely hooked. 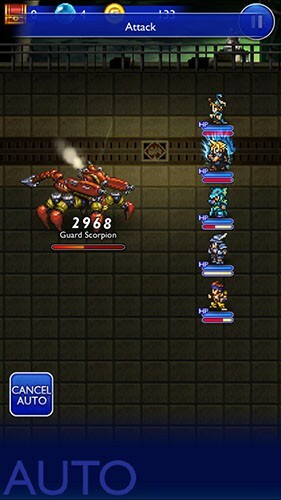 Final Fantasy: Record Keeper tugs at Final Fantasy fan’s heart strings from the moment you boot it up, the music of the game bringing back many fond memories of all the Final Fantasy games over the years. That isn’t where the fan service ends though; the whole premise of Final Fantasy: Record Keeper sees you re-living the epic battles from throughout the whole Final Fantasy franchise in a 16 bit style whilst controlling a dream team of your favourite characters. The story is a simple one – you control Tyro, a record keeper, as he works to protect paintings from a darkness that has fallen upon the world. These paintings depict a scene from a Final Fantasy game and in order to protect the painting you have to re-enact that scene. It could be the opening train sequence in Final Fantasy VII or perhaps your first traversal through Zanarkand in Final Fantasy X; there are so many memorable scenes to visit that you’re sure to encounter your own personal favourite along the way. Tyro doesn’t do this alone though and has companions Dr Mog and Final Fantasy stalwart Cid offering guidance throughout the game. The story of each Final Fantasy title is briefly told through snippets of text when completing each level, though it never really goes into much depth. 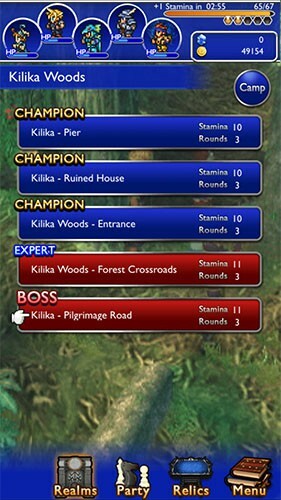 Usually Final Fantasy titles are known for offering a rich, in-depth narrative – Final Fantasy: Record Keeper instead keeps things brief and focuses on quick paced gameplay. It’s not an issue by any means – just don’t expect a full blown narrative experience here. Gameplay mainly consists of entering these paintings and playing through the battles that took place in the scene they depict. 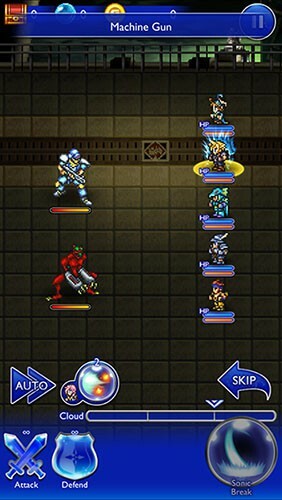 Battles are reminiscent of Final Fantasy VI, featuring 16 bit visuals and an ATB battle system. The 16 bit visuals are one of my favourite aspects of the game; it’s fantastic to see the likes of the Guard Scorpion from Final Fantasy VII or the ever pursuing X-ATM092 from Final Fantasy VIII perfectly re-created in sprite form. Developers DeNA haven’t been lazy with enemy designs either; the bosses you encounter are animated, offering them the sort of liveliness that is often missing from static sprites. 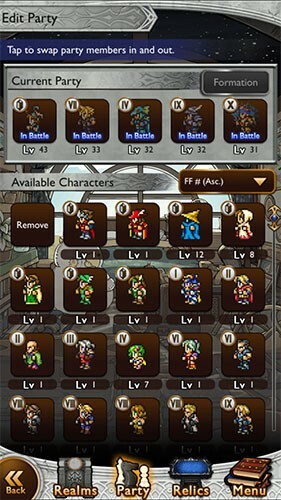 Whilst it’s nostalgic to see classic Final Fantasy enemies re-created in a 16 bit style, the best aspect of battles is putting together your dream team of Final Fantasy heroes. My party of Tyro, Cloud, Wakka, Steiner and Kain brought back floods of memories from their respective games. The further you progress the more characters you unlock, so you’re sure to unlock your favourites if you’re willing to put the time in – I’m slowly working towards unlocking Sephiroth and bringing the silver haired villain into my team. Enemy encounters offer a nostalgic feel too, with bosses and enemies utilising the same attacks, strengths and weaknesses from their original encounters in the Final Fantasy series. Whilst Final Fantasy VII fans will remember not to attack the aforementioned Guard Scorpion whilst his tail is up, they’ll also know that it is weak to lightning. Taking advantage of enemies’ weaknesses will reward you at the battle results screen, along with how much damage you inflicted, received and if you suffered any KOs. The better you perform, the better items you’ll receive – if you complete each battle perfectly you’ll master that level, giving you all the best bonuses on offer. You’ll gain plenty of loot during battles too. Items, weapons and equipment are based on those found in Final Fantasy titles, coming in a range of different varieties and varying rarities. Some items are common drops, whilst some will require a bit more work in order to find them. The most effective way to unlock new items is through a ‘relic draw’. 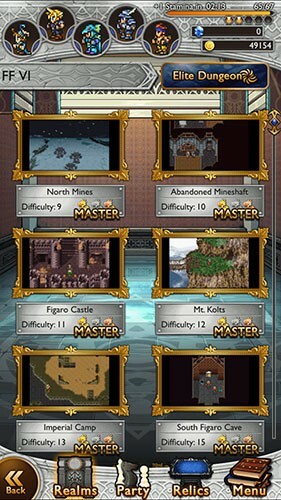 ‘Relic draws’ see you spending mythril (the in-game currency) in order to randomly unlock a new item – the quality of what you unlock varies, but it’s always a treat when you unlock a five-star rarity item. Final Fantasy: Record Keeper offers a surprising amount of depth, with a weapon upgrading system along with the ability to create new abilities. Classic spells such as ‘firaga’, ‘curaga’ or even summons like ‘Bahamut’ need to be crafted in order to use. It allows a sense of flexibility in what abilities you want made available to you, but it can be a bit of a grind seeking the items required to craft these abilities. The game always tries to reward progress though, especially with the ‘quests’ that offer new items or characters for completing minor objectives such as crafting abilities. 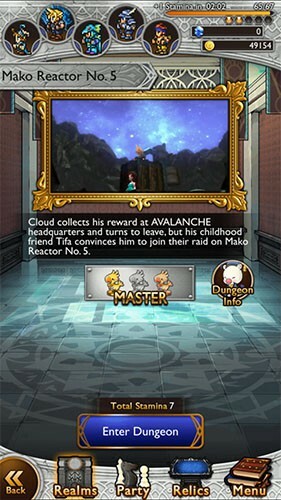 Being a free to play title, Final Fantasy: Record Keeper offers in-app purchases that can give you an advantage. These consist of a separate currency, gems, that can be used to refill your stamina (required to take part in battles) or unlock more ‘relic draws’. To Final Fantasy: Record Keeper’s credit, everything is obtainable from just playing the game – if you’re willing to put the time in, you will be rewarded. Nothing is locked behind a pay-wall, with everything in the game being achievable with a little patience. Stamina restores quickly and you’ll constantly unlock mythril, making the experience enjoyable throughout for those who don’t spend a thing. There are constant updates to Final Fantasy: Record Keeper so you won’t run out of anything to do anytime soon. I’ve put a ton of hours in so far and am still unlocking new story missions. There are also elite dungeons that offer the same missions at a higher difficulty (but with better rewards) and new event quests added on a regular basis, so there’ll always be something for you to work towards.